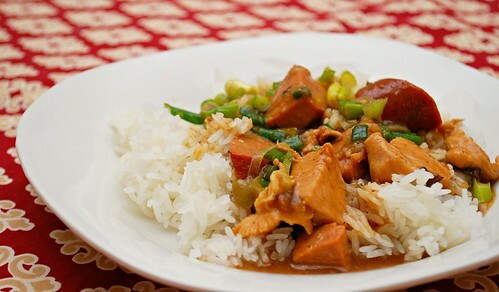 So a common question is - What's the difference between etouffeé, gumbo and jambalaya? It's easy to confuse the dishes since they involve similar ingredients. However, the main difference is the roux and thickness of the sauce. 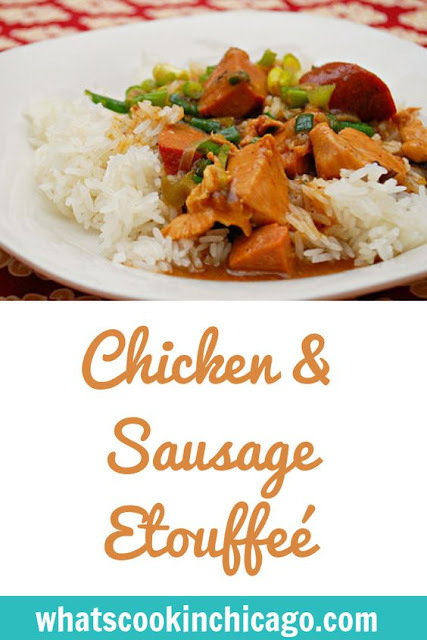 Etouffeé - is commonly made with chicken, sausage and/or shrimp (or a combination of these three) where the sauce is thick, much like a stew. It's often served over rice. Gumbo - is commonly made with chicken, sausage and/or shrimp (or a combination of these three) where the sauce is thin, much like a soup. It's often served with rice on top or on the side to stir into the gumbo. Jambalaya - is commonly made with chicken, sausage and/or shrimp (or a combination of these three) where there is no sauce, but rather rice is cooked along with the mixture. It's more similar to a Spanish Paella. Press SAUTE and add 1 tablespoon butter and sauté onion, bell pepper, celery, garlic and chicken until softened and tender; transfer to a bowl and set aside. In the now empty IP, melt remaining butter and whisk in flour, stirring to pick up any bits and pieces. Continue cooking and stirring until flour mixture (roux) turns a deep rust brown color. Whisk in Cajun seasoning, thyme, and chicken broth; cook for 1 minute. Return onion and chicken mixture along with sausahe and Worcestershire to the pot. Add green onions and salt to taste, stirring occasionally. Serve over hot cooked rice.